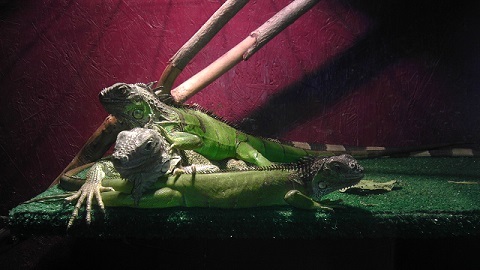 Home › Home › More Iguanas! Well, sort of. A family who could no longer take care of their 6-year-old female called the NC Aquarium to turn her in. 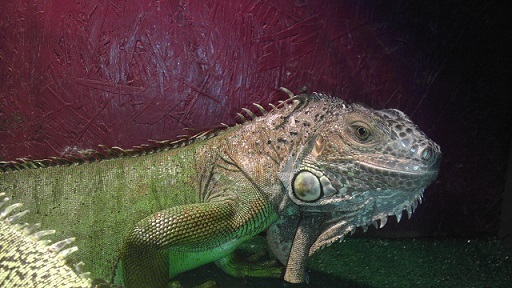 They don’t take iguanas, but the herpetologist who works at the Wilmington aquarium also works with our rescue. He drove to meet the family out-of-town and brought the new girl to us. Unfortunately, we do not know her name. All we know is they had her for about 5 years and her size says she is likely 6 years old. She has been very well taken care of. Mom thinks she needs to gain some weight, but mom likes fat iguanas. One of the most tell-tale signs of health is the base of the tail. If the tail is very skinny where it meets the body, the iguana is likely undernourished. This is where an iguana stores fat. This new girl has a nice looking tail base and spikes, and she is clearly used to human contact. We wish all turn-ins were in this good of health. Since she is such a sweet girl, she was actually adopted out yesterday. A very nice lady fell in love with her and the new girl seemed to be very happy sitting on her shoulder. This lady officially adopted her but did have to send her home with us for a day or two while she found a cage for her. The new iguana is a good size and needs a good size cage. Mom is happy to take care of her for a few days while her new mom gets her home ready. Sometimes she can be so sweet and other times she does not want to be touched. But this is environment is so completely different from what she is used to and adjusting can sometimes be hard.